Join us in the Abbotsford campus library on Tuesday, April 4th from 2-3 for a lively discussion about the dynamic nature of Canadian cuisine with Dr Lenore Newman. 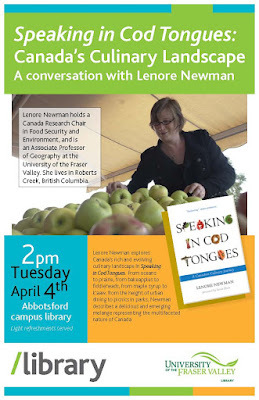 Lenore will be featuring her research and adventures from her new book, Speaking in Cod Tongues: Canada's Culinary Landscape. Learn how Canada's multicultural society expresses itself through its distinct "creole" cuisine such as butter chicken pizza or blueberry lassi. To whet your appetite, listen to Lenore's interview with Anna Maria Tremonti on CBC's the Current. Refreshments and treats will be served and all are welcome. What Can We Learn from Community Cookbooks? Read about community cookbooks in the Globe and Mail and discover the origins of the butter tart and Nanaimo bar. The local charitable groups and organizations, who published the majority of these books, would write about the availability of ingredients and technologies of the time in their books. 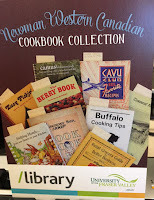 UFV Library has its own special collection of community and local cookbooks. 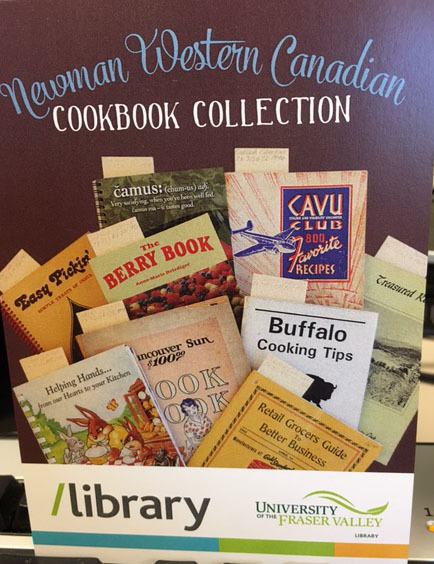 The Newman Western Canadian Cookbook Collection was established in 2015 and reflects the culinary heritage of the western Canadian provinces and two northern territories. Discover more about the Newman collection in our research guide and online exhibit. UFV Library's first Human LIbrary event takes place in the atrium of the Canada Education Park campus, just outside the Chilliwack library, on Wednesday, March 15, between 10 a.m. and 1 p.m.
Buddhist nun Sister Jessie and Sufis Sandy Hill will start the day with a short conversation between them, then readers will move among books for 20-minute readings, followed by 10-minute breaks. Call the Chilliwack library at 604-795-2824 to register for this event. 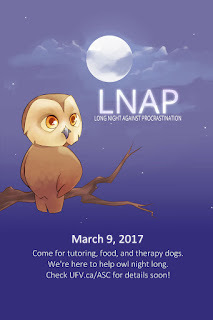 Free Black & White Printing for Students Registered for LNAP! This just in... Students registered for the Long Night Against Procrastination in the Abbotsford and Chilliwack libraries on Thursday, March 9, can print in black and white for free from 5 p.m. to midnight. Come alone, bring a friend, or sign up as a group. The event of the semester is taking place on Thursday, March 9 from 5 p.m. to midnight in both campus libraries. Papers are due! Finals are coming, but panic is NOT setting in! You are calm and relaxed because you are getting a jump start on your preparation to avoid all of that last minute cramming. Come alone, bring a friend, or sign up as a group. 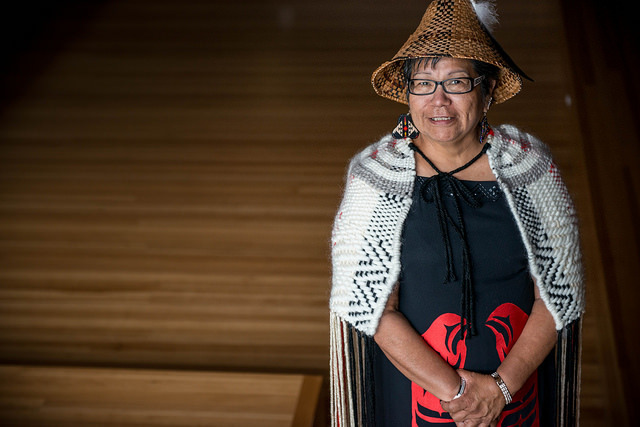 For the first time, UFV library is participating in the Human Library Initiative. 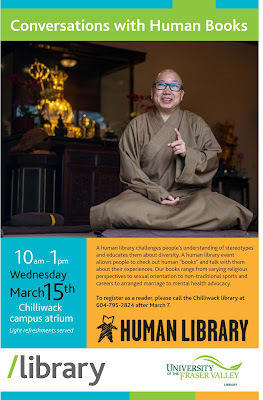 UFV Library’s event will be held in the atrium of the Canada Education Park campus, just outside the Chilliwack library, on Wednesday, March 15, between 10 a.m. and 1 p.m.
A human library seeks to promote understanding and bust stereotypes. Typical human library “books” might focus on topics like racism, non-traditional roles, mental illness, single parenthood, LGBTQ experiences or religion. To read more about our books, not all of whom may be available for the human library event, check our website: http://www.ufv.ca/library/exhibits--events/human-library-display-and-event/. To stay in touch, watch the library’s Facebook page: https://www.facebook.com/UFVlibrary/. To register as a reader, please call the Chilliwack library at 604-795-2824 after March 7.